Identifying Drain and Sewer Blockages – Cost Effectively! With over 50 years' experience clearing blocked drains and sewers across Melbourne, we have seen everything! In recent years, it's often through the eyes of a camera – a Drain Pipe Inspection camera. We use the latest technology and equipment to ensure problems are identified quickly with the minimum possible intervention. A drain camera can be guided down your sewer or drainage pipes to identify the source of a problem or blockage. As it goes along, we can see exactly occurring via a video monitor. Problem spots can quickly be identified. It often keeps us from having to rip up and replace sections of underground pipes – savings customers thousands! If we do locate a major problem, you can rest assured that our team can solve it. 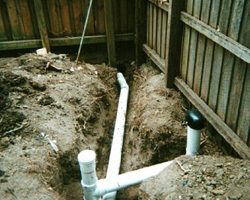 Woolley’s Plumbing staff have the equipment and experience to repair blocked sewer and storm water drains in anywhere in Melbourne. We can help solve problems with your septic or sewer treatment system. Having problems with a sewer or stormwater drains? Our experts are here to help in all Melbourne suburbs! For assistance with your blocked sewers or drains, call us on 1300 367 626 or email us.